Bullish options strategies are employed when the options trader expects the underlying stock price to move upwards. Bearish options strategies are the mirror image of bullish strategies. They are employed when the options trader expects the underlying stock price to move downwards. A bull call spread is constructed by buying a call option with a low exercise price (K), and selling another call option with a higher exercise price. 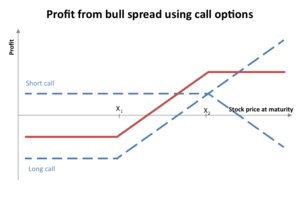 A bull spread can be constructed using two call options. Often the call with the lower exercise price will be at-the-money while the call with the higher exercise price is out-of-the-money. Both calls must have the same underlying security and expiration month. Take an arbitrary stock XYZ currently priced at $100. Furthermore, assume it is a standard option, meaning every option contract controls 100 shares. Assume that for next month, a call option with a strike price of $100 costs $3 per share, or $300 per contract, while a call option with a strike price of $115 is selling at $1 per share, or $100 per contract. A trader can then buy a long position on the $100 strike price option for $300 and sell a short position on the $115 option for $100. The net debit for this trade then is $300 - 100 = $200. This trade results in a profitable trade if the stock closes on expiry above $102. If the stock's closing price on expiry is $110, the $100 call option will end at $10 a share, or $1000 per contract, while the $115 call option expires worthless. Hence a total profit of $1000 - 200 = $800. The trade's profit is limited to $13 per share, which is the difference in strike prices minus the net debit (15 - 2). The maximum loss possible on the trade equals $2 per share, the net debit. A bull put spread is constructed by selling higher striking in-the-money put options and buying the same number of lower striking in-the-money put options on the same underlying security with the same expiration date. The options trader employing this strategy hopes that the price of the underlying security goes up far enough such that the written put options expire worthless. Take an arbitrary stock ABC currently priced at $100. Furthermore, assume again that it is a standard option, meaning every option contract controls 100 shares. Assume that for next month, a put option with a strike price of $105 costs $8 per share, or $800 per contract, while a put option with a strike price of $125 is selling at $27 per share, or $2700 per contract. A trader can then open a long position on the $105 strike put option for $800 and open a short position on the $125 put option for $2700. The net credit for this trade then is $2700 - 800 = $1900. This trade will be profitable if the stock closes on expiry above $106. If the stock's closing price on expiry is $110, the $105 put option will expire worthless while the $125 put option will end at $15 a share, or $1500 per contract. Hence a total profit of $1900 - 1500 = $400. The trade's profit is limited to $19 per share, which is equal to the net credit. The maximum loss on the trade is $1 per share which is the difference in strike prices minus the net credit (20 - 19). Payoff chart from buying a butterfly spread. Profit from a long butterfly spread position. The spread is created by buying a call with a relatively low strike (x1), buying a call with a relatively high strike (x3), and shorting two calls with a strike in between (x2). In finance, a butterfly is a limited risk, non-directional options strategy that is designed to have a large probability of earning a small limited profit when the future volatility of the underlying is expected to be different from the implied volatility. A long butterfly position will make profit if the future volatility is lower than the implied volatility. The maximum value occurs at X (see diagram). A short butterfly position will make profit if the future volatility is higher than the implied volatility. A short butterfly options strategy consists of the same options as a long butterfly. However all the long option positions are short and all the short option positions are long. The double option position in the middle is called the body, while the two other positions are called the wings. The option strategy where the middle two positions have different strike price is known as an Iron condor. In an unbalanced butterfly the variable "a" has two different values. Long and Short Butterflies graphically illustrates component options in long and short butterflies.